Reconnaissance of the Western Coast of the United States (Lower Sheet) San Francisco to San Diego. 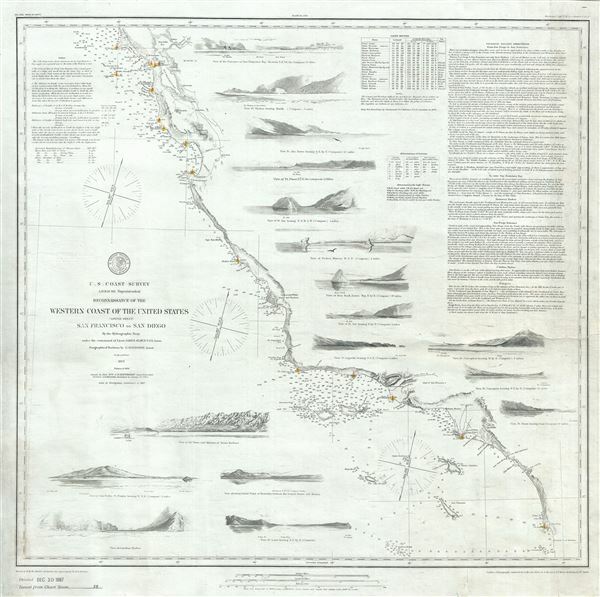 This is one of the most attractive and desirable of the original U.S. Coast Survey charts of the California coast. Printed in 1887, this chart coves the western coast of the United States from San Diego and the Mexican border north as far north as Pt. Reyes and the San Francisco Bay. It details San Diego Bay, 'El Pueblo de Los Angeles' and the Los Angeles Valley, the Mission of San Fernando and the San Fernando Valley, and the San Francisco Bay area including San Francisco itself, Oakland, San Jose, Union City and Alviso. The hydrographic work for this important chart was completed by James Alden. The Geographical positioning was accomplished by G. Davidson. Prepared and under the supervision of A. D. Bache, one of the most important and influential superintendents of the U.S. Coast Survey in the 19th century. Very good. Minor damage and repair lower margin, not extending on to printed map. Some creasing and cracking in lower right quadrant, with verso repair. Professionally flattened and backed with archival tissue.